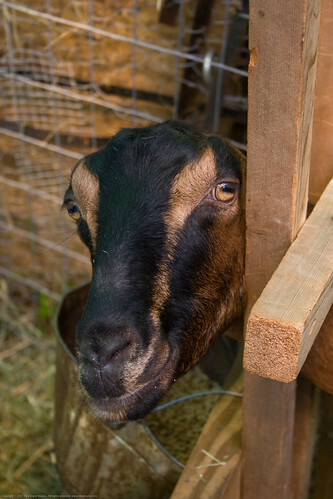 You are browsing the Blog for goat. Humble Garden 2008 from nika on Vimeo. Here is the Humble Garden video for 2008 (I shoot these with my MacBook Pro, forgive the quality). 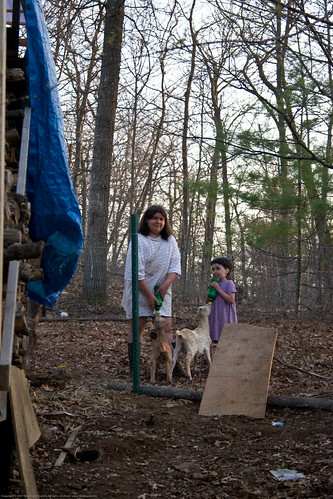 In it I share my family, our organic vegetable garden, our chickens, our LaMancha diary goats and our guard Llama. I also share a bit of my Colombian culture through the music so turn on your speakers and enjoy. Let me know what you think! Hope we do not seem too odd to you! We are enjoying our independence from the food chain. We get our eggs and our milk (and now cheese) from our backyard. We eat our salads from our backyard. If you donâ€™t now, what are you waiting for?! If you think food prices are high now, you will be pale with shock soon enough. Think oil-based fertilizers, oil-based pesticides, oil-run tractors and trucks, think floods, think drought, think 2008. The seed companies are reporting a 40% rise in seed sales this year (they were shocked, didnâ€™t see it coming, these people need to get on the web more often). 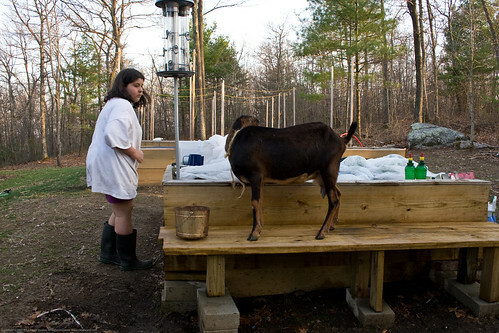 Now that the baby goats are not such babies and are fully weaned, we have more goat milk to work with. 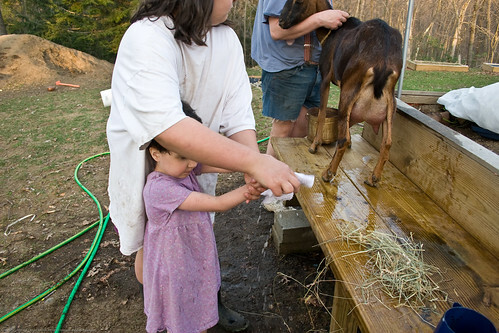 We go through less than 1 gallon of fluid goat milk a day for Baby O (who adores goat milk and is sensitive to lactose in pasteurized cow milk). Our milking doe, Torte, gives us about one and 1/2 gallons of milk a day. Over two days, we then have one extra gallon of milk, works out nicely. 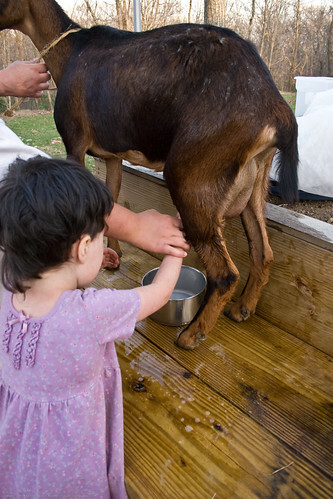 You may or may not know that it is hard to make cream or butter from goat milk because the fat doesnâ€™t separate out (because the fat globules are smaller and stay spread out, like its been homogenized). We could make it if we bought a $400.00 cream separator but thats not going to happen! I love goat cheese just fine. We will be getting a jersey cow/calf to have super high quality milk, cream, and butter. I can wait for that. Back to the topic for today. 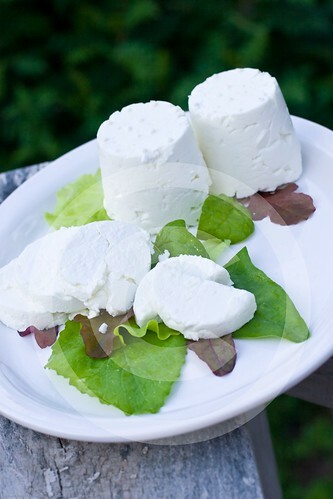 It is VERY easy to make chevre but it takes a few days, you simply have to be patient. We are using milk we pasteurized for this batch, we may go raw with he next batch. 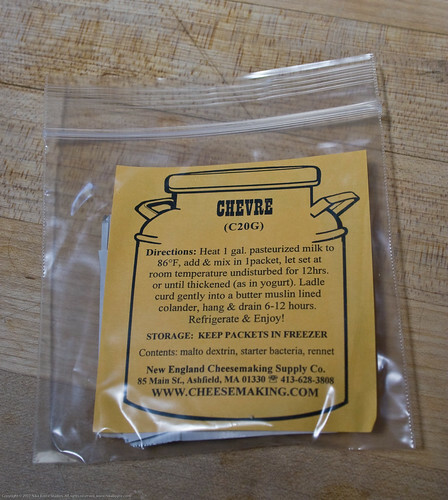 We used a chevre starter from the New England Cheesemaking Supply Company, I can not recommend them highly enough. This little packet is enough for one gallon of milk. This could not be easier, you just bring your milk up to (or down to as the case may be) to 86 F and sprinkle the starter in. Mix well and let culture at room temperature for 12-20 hours. 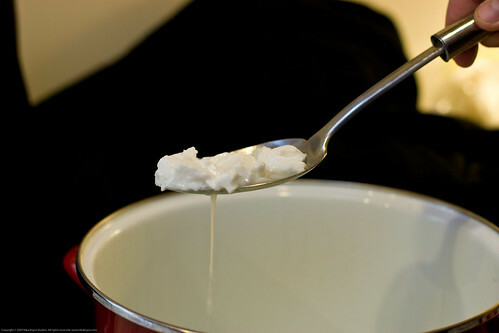 The curd sets up and excludes the whey. 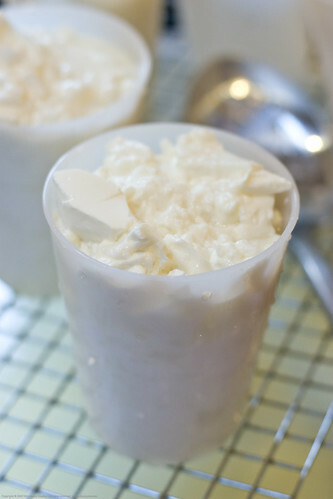 You then slice it up a bit so that the mass of curd is broken up and more whey is excluded. Remember that all of the equipment being used must be sterilized. 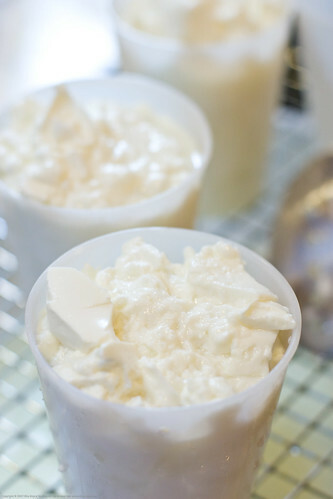 We bought the plastic chevre molds from the New England Cheesemaking Supply Company which I cleaned very well. These are well worth the cost and will last a long time. 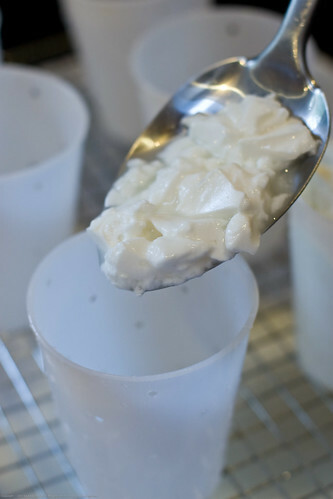 Using a sterilized slotted spoon, you scoop out the curds and begin to fill the molds. One gallon of milk yielded three molds worth of cheese. 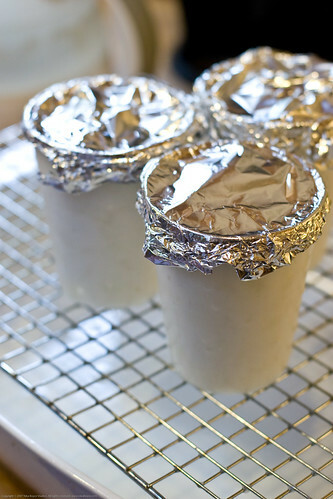 Once they are filled they go on a wire rack over a pan or bucket to catch the dripping whey, cover the tops and let sit at room temperature or in the fridge for 2 days. They will shrink a lot. 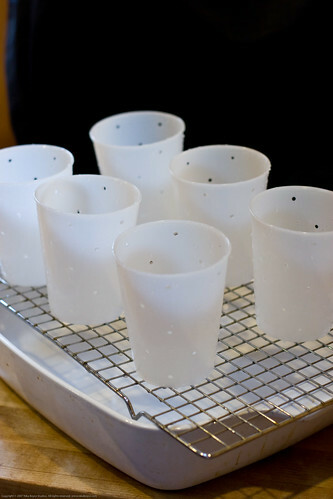 After the two days, the cups were no longer dripping and the cheese was quite firm and much dryer. This cheese tastes unbelievably fresh and, I think, uniquely ours. 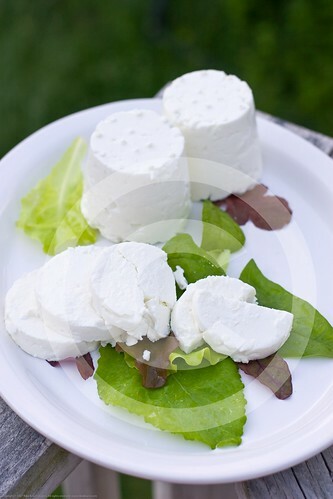 Its a fantastic feeling to sit down to a salad that we grew topped with chevre we made from our own goat. I watched Torte munching on tree bark in our backyard as I nibbled on the cheese. First I want to thank all of you who have gone to the trouble of doing the egg price survey in my last post. I am going to post up a map with prices (from around the world!) and talk about some of the numbers and comments. 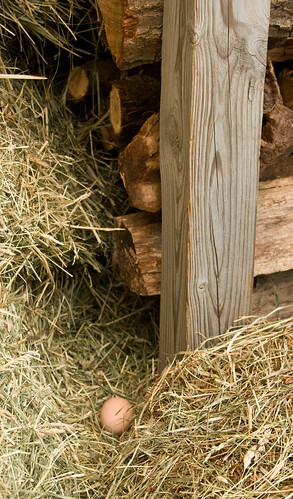 Today I am going to share some scenes from around our little growing homestead. 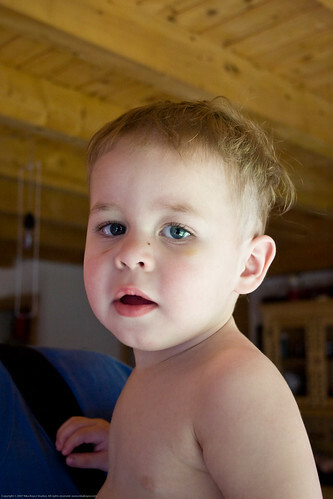 We are shooting for full food independence this year and milk is a huge part of this. As you know we have two baby goats and we also have one momma goat (named, Millet, Wheat, and Torte, respectively). The pictures in this post show Q and KD milking Torte. We have since set yup a stanchion in the wood shed where the milking goes better. We get about 1/2 gallon of milk a day. My mom got me a pasteurizer for my birthday (thanks mom!!) and I can not wait for the babies to be weaned so I can start making some chevre!